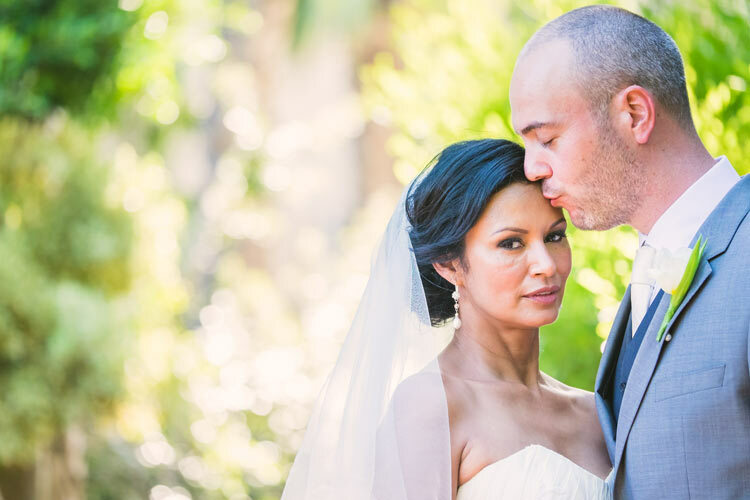 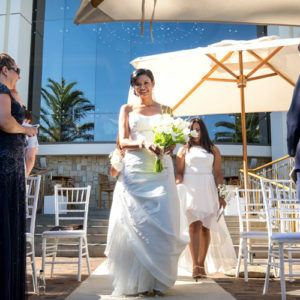 The decorated Vista deck reflected the style and elegance you envisaged for this spectacular day. 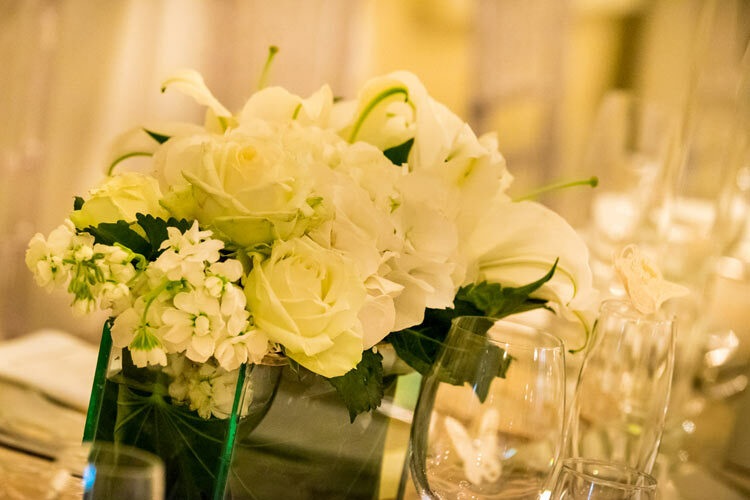 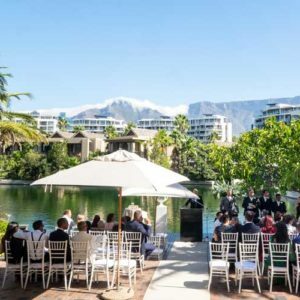 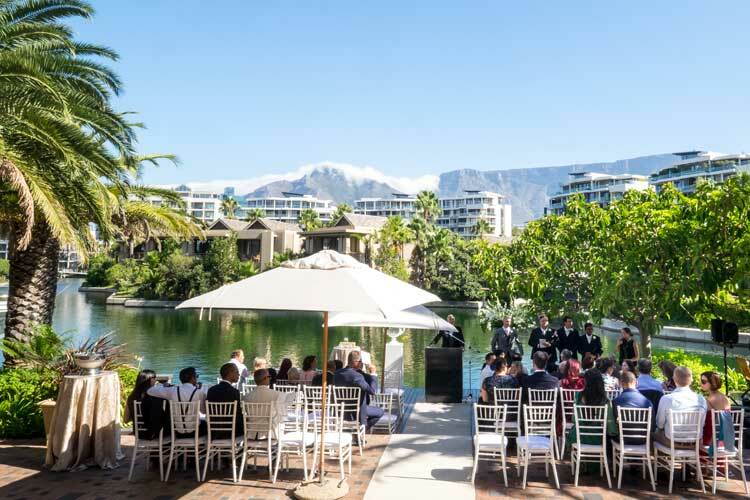 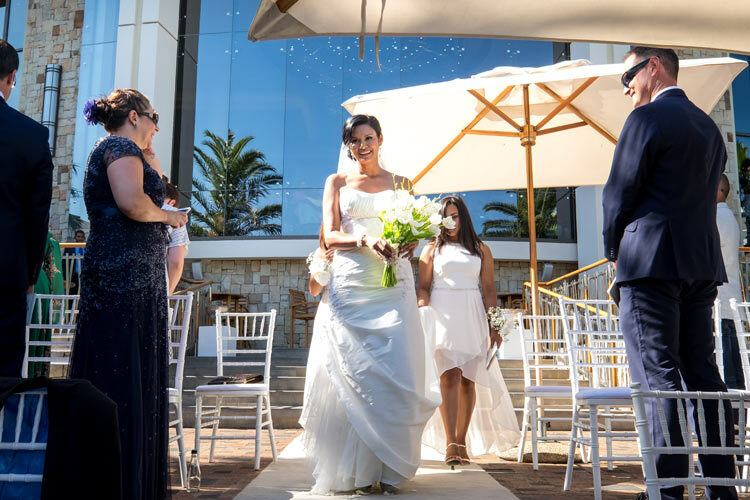 Two large mass flower displays created with exploding white gladiola in large white urns on white plinths framed you guys as you were saying your vows on the wooden deck. 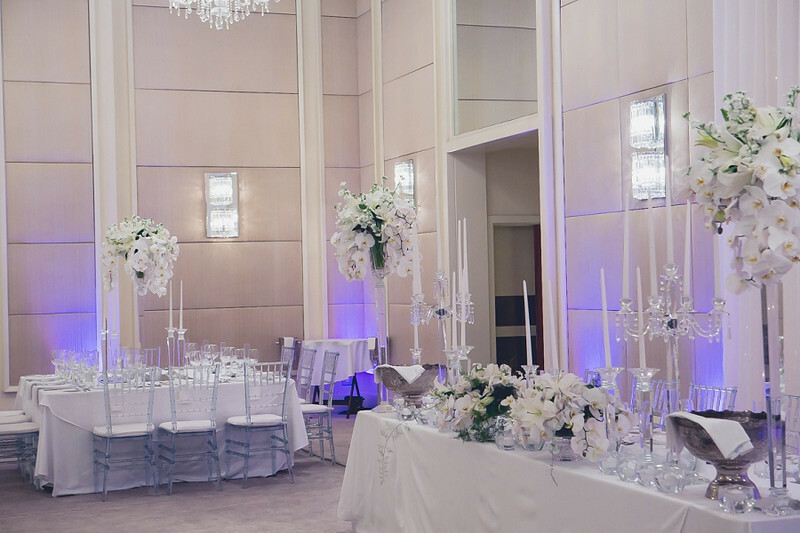 The fairy light back drop cascading from the ceiling to the floor on the opposite side of the Ball Room immediately set the whimsical ambiance you envisaged for this celebration. 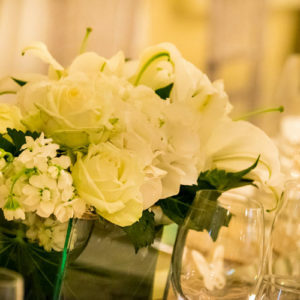 Ten large plants in white pots were scattered throughout the room, combined with a white leather lounge area which was used as the “photo studio” later in the evening, all this creating a more intimate ambiance, filling the room fabulously. 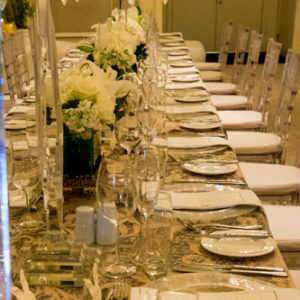 The glass cake table with the spectacular cake by Wade on the one side of the sweetheart main table complimented the all glass and crystal look. 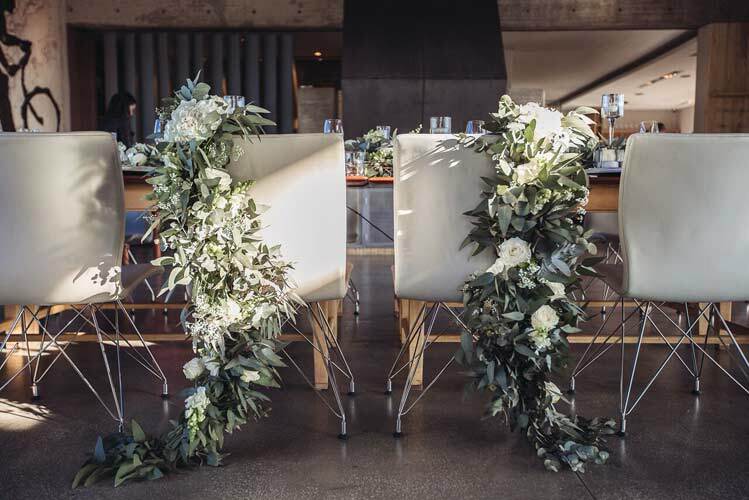 The two large mass flower displays from the Ceremony were placed on either side of the main table, framing this VIP setting under the fairy light waterfall. 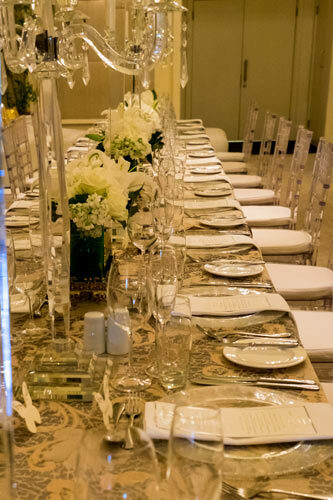 The large U-shape table set up was covered with a stunning old gold and silver brocade full length table cloth. 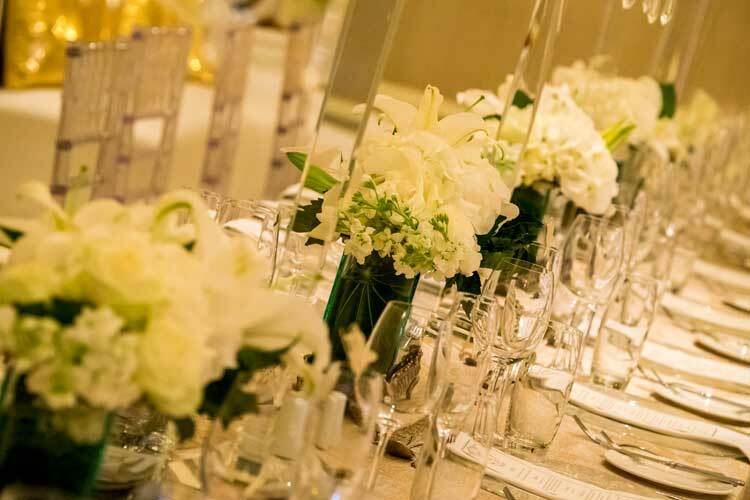 The Hotel’s white napkin was placed on a beautiful glass under plate complimenting all glass and crystal throughout. 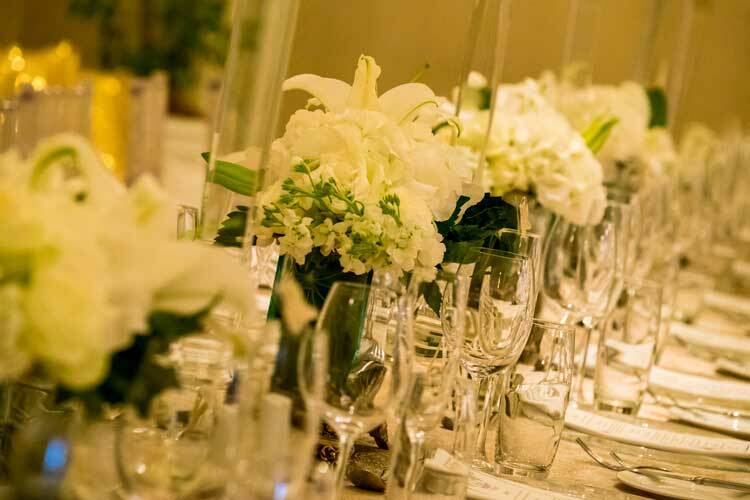 The tables were set as per the Hotel’s outstanding standard with beautiful glassware and silver cutlery. 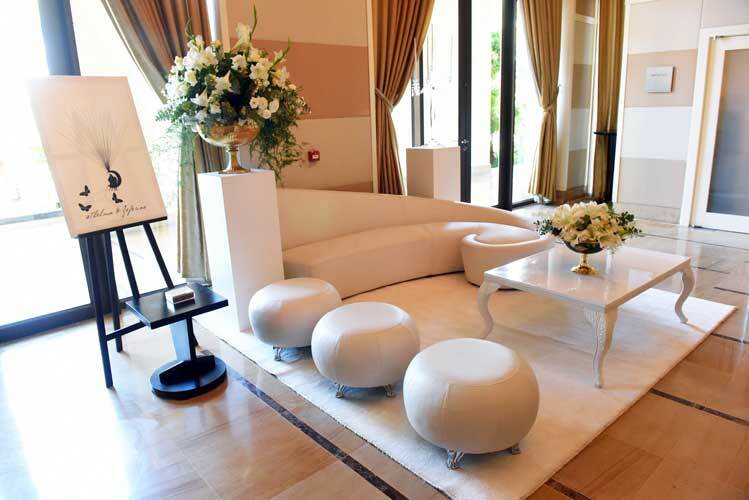 The ghost Tiffany chairs from the Ceremony were placed around the tables complimenting the all over look. 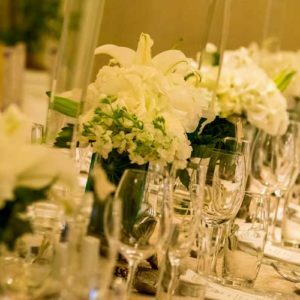 This nearly 30m long table (once all set up) were fully decorated with crystal candelabra and extra dangling crystals with pillar candles, several 90cm crystal candle sticks with fat pillar candles, loads of rectangular glass boxes on/in silver trays filled with white hydrangea, open Casablanca lilies, puffy white avalanche roses and white stocks, all lit up with nearly 50 glass boxes with silver inlays and white floating candles, fabulous, romantic and stunning. 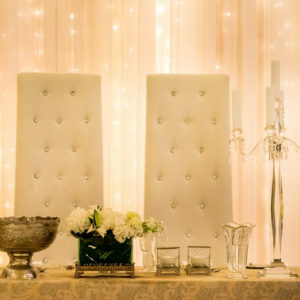 The sweetheart main table was indeed a focal point in the room. 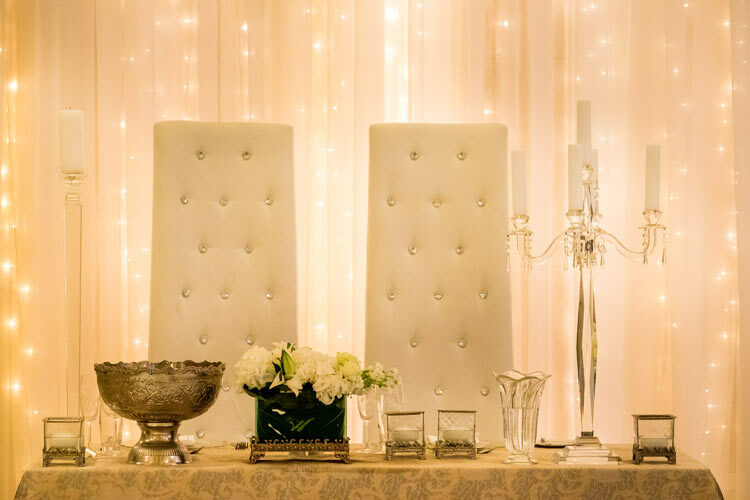 We placed two high back his and hers chairs with diamante detailed buttons behind the table under the cascading fairy light waterfall for the two most important persons at the wedding. 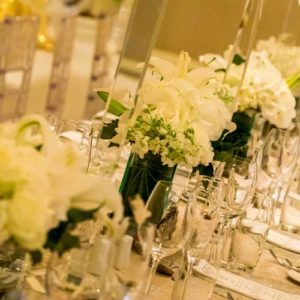 The front of this VIP table were decorated with a large silver champagne bowl filled with ice and champagne, a crystal candelabra with extra dangling crystals and pillar candles, two 90cm crystal candle sticks with fat pillar candles, four smaller glass boxes with silver trays filled with white hydrangea, open Casablanca lilies, puffy white avalanche roses and white stocks, a crystal vase for the bridal bouquet, all lit up with ten small glass boxes with silver inlays and white floating candles. 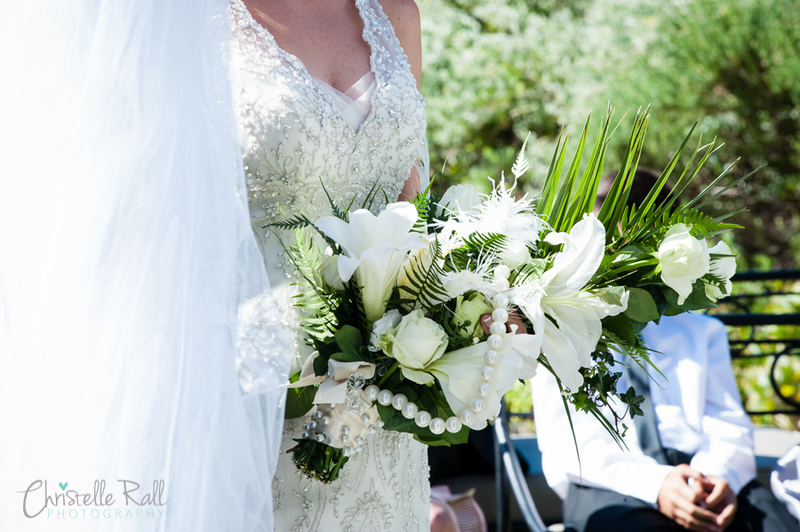 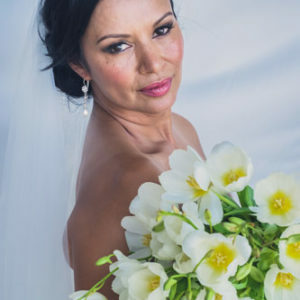 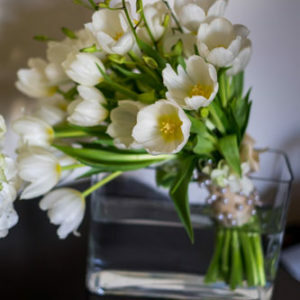 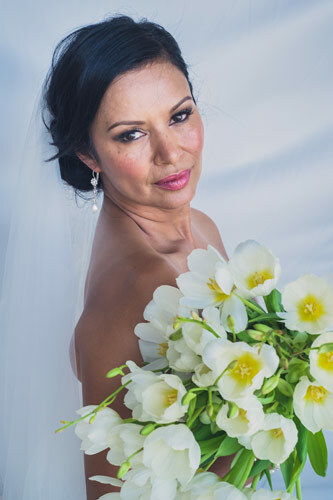 The bridal bouquet was a bunch of white tulips (ala natural look), tied with ivory satin ribbon and complimented with crystals and pearls on the holding bit. 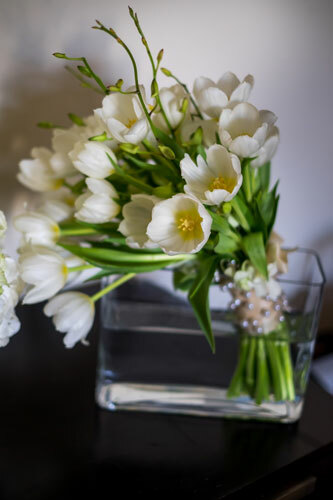 A white tulip buttonhole was for the Groom. 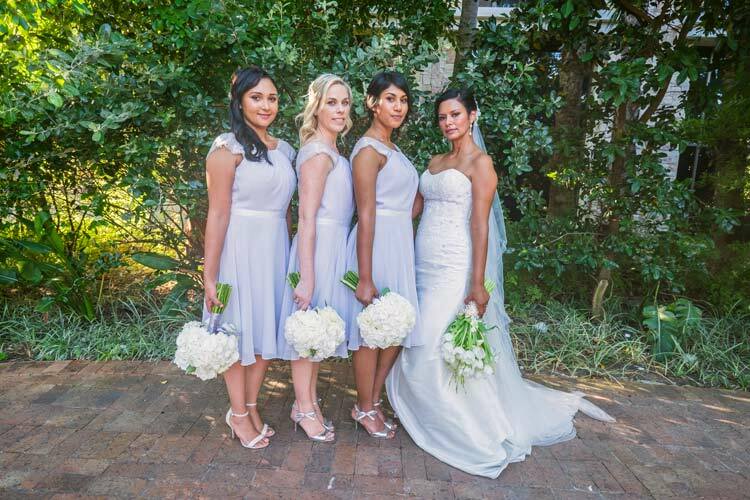 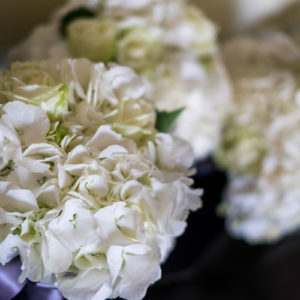 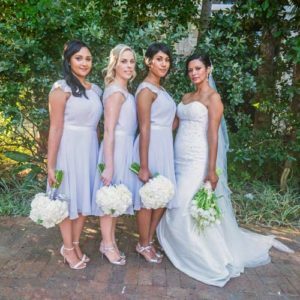 The three bridesmaids each carried a posy of white hydrangea tied with silver satin ribbon. 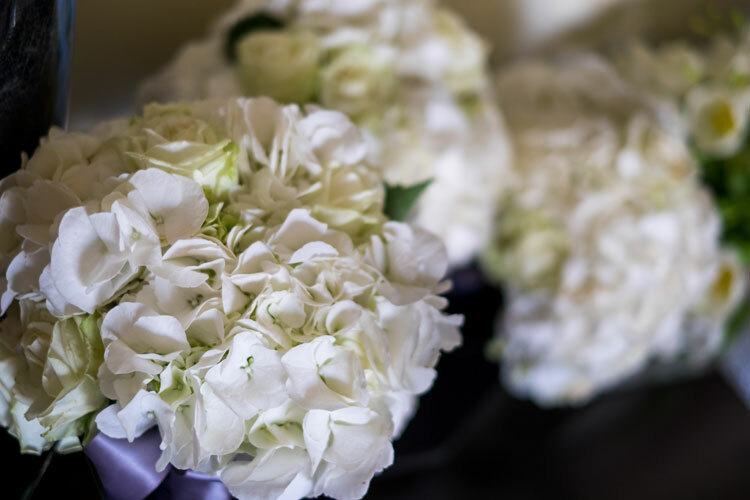 The gents in the bridal party each had a white rose buttonhole and pearl pin.